PONANT invites you to set sail aboard Le Boréal for a memorable 14-day expedition cruise to the discovery of Baffin Bay. 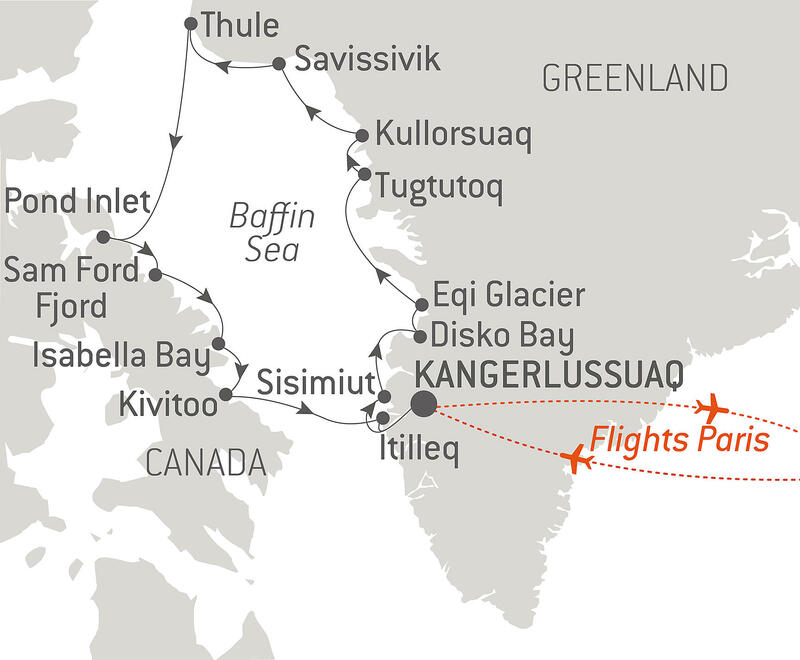 You will embark in Kangerlussuaq for an unforgettable journey in the heart of the most magnificent Arctic landscapes. The first destination is the North-West coast of Greenland which will welcome you with its majestic icebergs, colourful villages encircled by mountains and its basalt formations. This is the ideal opportunity for meeting the local population and learning about Greenland Inuit culture. The North of Greenland will then reveal its remote villages of peat houses where the last bear hunters and narwhal fishers live in the middle of the Arctic tundra according to their ancestral traditions. You will also see the remains of ancient Inuit civilisations and will discover Savissivik, the largest “iceberg graveyard” in Greenland. During the last days of your cruise, Le Boréal will sail along the eastern coast of Baffin Island, in the Nunavut, Canada. With its immense cliffs, bird colonies and fjords, this destination will definitely delight you. • Outings and shore visits in Zodiac® inflatables with your naturalist guides. • Visit traditional villages and encounter the Inuit people. • Disko Bay, listed as a Unesco World Heritage Site, to see the Northern Hemisphere’s largest icebergs. • Landscapes: ice floes, jagged mountains, icebergs, ice caps, steep-sided valleys, sheer cliffs, huge glaciers. • Wildlife: polar bears, a lot of caribou, Arctic terns, walruses, whales, musk oxen.